Ep 9: "Natto Jjigae and DIY Bibimbap of Jeonju City, South Korea"
There are buses and trains going from Seoul to Jeonju. Jeonju [전주시]. According to wiki, Jeonju is "the 16th largest city in South Korea and the capital of North Jeolla Province (...) An important tourist center famous for Korean food, historic buildings, sports activities, and innovative festivals." It is also famous for its bibimbap. Places to visit are the National Jeonju Museum, the Jeonju Hanok Village (Hanok Maeul, pic above), as well as castles and parks. Kankoku [韓国]. The Japanese name for "Korea" which is basically South Korea. They call North Korea "Kita Chosen" [北朝鮮]. Bibimbap [비빔밥]. It means "mixed rice". It includes namul, gochujang, doenjang, egg, sliced meat, kimchi, sesame oil, etc. Jeongsik Baekban [정식백반]. "Baekban" [백반] has two meanings: "fluffy white rice" and a "set meal". In order to differentiate between them, you sometimes add "jeongsik" [정식] (means "formal") to mean the latter, which includes a main course, soup, and side dishes. What Goro ordered was a baekban with cheonggukjiang jjigae as the main. Cheonggukjang Jjigae [청국장찌개]. 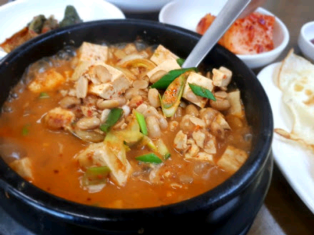 Cheonggukjang [청국장] is fermented soybean paste while "jjigae" [찌개] means "stew". Goro says it's like Natto Jiru [納豆汁] (natto and miso soup) in Japan. Jeyuk Bokkeum [제육볶음]. Stir fry spicy pork belly dish, that Goro mixed with his bibimbap. Dolsot [돌솥]. Literally "stone pot". It's made of agalmatolite, often heated to serve food like rice and stews. In Japanese, it's called "ishinabe" [石鍋]. Odeng [오뎅]. The deep-fried fish paste formed into balls that Goro ate is called "odeng", a borrowed word from the Japanese "oden". But unlike "oden" which can have various kinds of ingredients, "odeng" usually only has fishcakes served in spicy soup. Nurungji [누룽지]. It's basically scorched rice stuck on the bottom of a dolsot, which one can scrape off and eat as it is, or pour hot water in it, just like what Goro had in this episode. Dwaejimulgogi Baekban [돼지물고기]. Seen price: 9,000 won, Fish-Pork Set Meal. 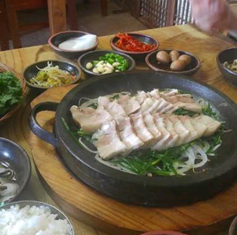 Bossam Jeongsik Baekban [보쌈정식백반]. Seen price: 12,000 won, a set meal that has side dishes centered around pork belly that's boiled in spices and thinly sliced. Mugeunji Dak-Bokkeum tang [묵은지닭볶음탕]. The most expensive item in the menu (45,000 won). This formal set meal centers around spicy stew of chicken and aged kimchi. This Episode's Guests. Park Jung-ah who played the role of the assistant and guide, started out as a singer of the girl group Jewelry, and has developed a career as a solo entertainer. The president was played by Korean singer/actor Sung Si Kyung. He said he is a fan of "Kodoku no Gurume", and has visited some of the shops featured there. He has even memorized the opening narration of the show. 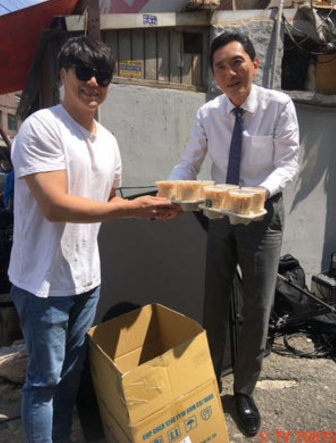 Above pic was taken when he visited the filming site on the day he wasn't involved in the shoot, bringing drinks for everyone. Self [セルフ]. Goro called the mix-it-yourself bibimbap, "self bibimbap". "Self" can mean "self-service", "do-it-yourself" "make-your-own" type of dining. The first time that Goro did a "self" dining inside a shop was in the udon shop featured in the 2018 NYE's Special. Oni ni kanabo [鬼に金棒]. It means "making a strong person even stronger" (like giving a metal rod to an ogre) or "as strong as can be". It can also mean "to make doubly sure", or you think you're strong (or can win) but just in case, better bring something that can help you become even stronger. Goro said what a metal rod is for an oni, it was rice for him. Hi Admin, first of all awesome job as always! A few notes on the Korean translation. The city Goro went to in this episode is Jeonju, not Cheongju. Although slightly similar in pronunciation, they are actually two different cities in two different regions. Would be great if all references to Cheongju can be replaced with Jeonju in the translation. 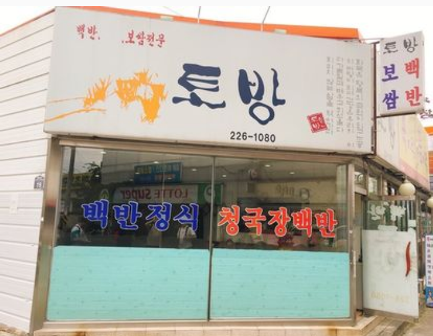 The sae-al in 새알팥죽 (sae-al patjuk) means bird's egg, because the mochi balls look like bird's eggs. When i googled jeongju or something, the first thing that came out was cheongju. I thought that was the spelling. Thank you! I'll correct it next time.